Prime Minister Tony Blair's memoir, "A Journey," is a long one. Almost 700 pages. My journey, by contrast, to meet the former Prime Minister and purchase his tome was shorter than Donovan McNabb's tenure as a Redskin. So I was nervous. Would Mr. Blair have time to sign the book I bought for my father-in-law for Christmas? Could I engage him in a meaningful conversation? Should I lower my expectations of the entire event? The answer to that one was easy. Of course I should, but it simply wasn't possible. This, after all, was the man the British criticized as being President Bush's lapdog for his support of the Iraq War. This was the man the British also claimed was the charismatic equal to President Clinton. Someone who could feel my pain? I'd been to England, even went to boarding school there for a few months, and once while I was out for a jog, I tripped and lay crying and bleeding on the sidewalk. Everyone who passed by stepped around me, upper lip firmly in place. Tony Blair has always been billed as the guy who would stop and lend you a hand. I nearly tripped trying to get to Tony Blair when he arrived into former Ambassador to Portugal Elizabeth Bagley's elegant, large, and filled-to-capacity living room in Georgetown. Invited into that living room, 11 U.S. Senators, 3 members of the House of Representatives, a former Virginia governor, a man who wants to be a Virginia governor, Ambassadors from Kenya, Monaco, Spain, Finland, Canada, Panama, Portugal, Tanzania, France, Singapore, and the U.K. And a few journalists you might have heard of: Judy Woodruff, Rita Braver, and Maureen Orth. I had stimulating conversations with some of them. When I asked Braver to sign a copy of the Blair book, she told me a story about then-Senator Ted Kennedy getting irked that then-President Clinton was happily scribbling his signature in Kennedy's book. Rep. Donna Edwards from Maryland assured me she would do interviews in the dark, on Capitol Hill, in the frigid December temperatures, at 5 in the morning, even if her staff didn't like the idea. And Rep. Peter King from New York limped in with a cast on his broken foot, and shared his notion that the pinky toe should've been phased out decades ago. Nearly two decades earlier, I'd had the honor of sitting on Mrs. Bagley's couch, just to my right this night, before she was Ambassador, seeking her best advice on a career in law or journalism. Now, I was back, but not necessarily because of my affiliation with NBC or our brief history together. More likely because her youngest sister has a second grader at the same school where I have a second grader, and they plan to marry sometime after college. I spared the Prime Minister that information. Someone handed Mr. Blair a drink, either a gin and tonic or a 7-Up on the rocks, and before he could take a sip, one of his admirers asked him to sign a copy of his book which was conveniently on sale in the foyer. He obliged, by putting down his glass, and taking a seat behind a small antique writing table. "Have you read President Bush's memoir, Decision Points?" I asked eagerly, as if I had some inside information that surely his BFF's book was top of his reading list. The former Prime Minister looked up. "No, no I haven't." It was awkward. I couldn't stand the silence. So, I tried to save him, because surely a politician in the public eye for over two decades needed saving. "But, you will. You plan to," I offered. And then, "Yes, I plan to." It's no fun when politicians repeat what you say. When non-politicians do it, there's a small celebration that can happen for a journalist if that's just the sound bite you were hoping for. But when the Prime Minister did it, I had no idea if he really meant it. I wanted so much to hear something new, something he'd never told anyone else. Another pause. I finally realized he was waiting patiently for me to say my name -- or any name -- so he could properly inscribe the title page. 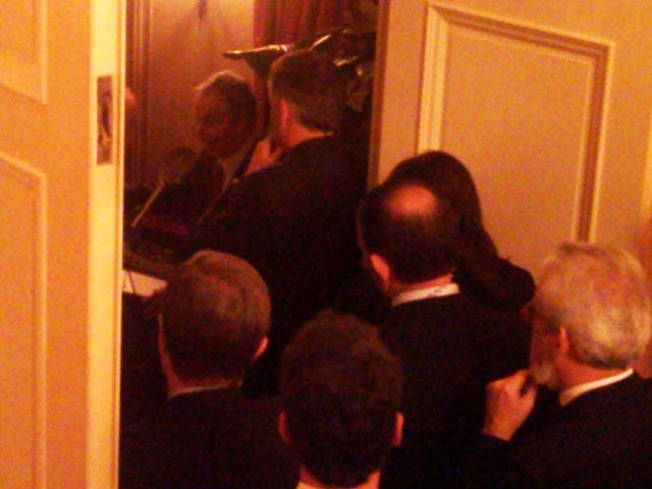 A few moments later, Prime Minister Blair took the floor. "Politicians are just people," he began, and a few of us needed to be reminded of that wisdom. He shared a charming story about sending his first text recently, and the person who received it wrote back, "Who IS this?" He spoke about his admiration for the American spirit -- "exuberance that is sometimes irrational," he teased. He was gracious and funny and ... personal. It's fair to say most guests felt a connection to him when he spoke to all of us. I regretted having felt so eager. I had to rush off to watch the Caps lose their seventh straight, not enough time to think each of my eight parents (step-parents and in-laws included) would've liked a signed book. But then I would've had to plop an entire stack of books in front of Mr. Blair and simultaneously try to convince him that I was not a New Labour groupie. I imagine the former Prime Minister had at least one regret. I'm fairly sure he never saw his cocktail glass again.